In today’s day and age, we rely on everything electronic. We rely on, and maybe even are addicted to, our smart phones. We connect our houses and cars to our phones, as well as our pets. But all of this modern technology comes at a price. We pay more to get better internet service and phone service for our electronics. We ditch perfectly good laptops or other devices to get the latest and greatest version. Not to mention the extra electricity we use to be connected 24/7. Whatever happened to good old fashioned fun? Whenever the power goes out these days, people panic because everything they use needs electricity. Can we go back to our roots and not rely on electricity and technology for every aspect of our lives? Yes, we can. In fact, as much of a trend as it is to have the latest and greatest technology, there is also a trend of trying to go green and not rely on modern technology. Believe it or not, going natural can mean some major savings in your budget. 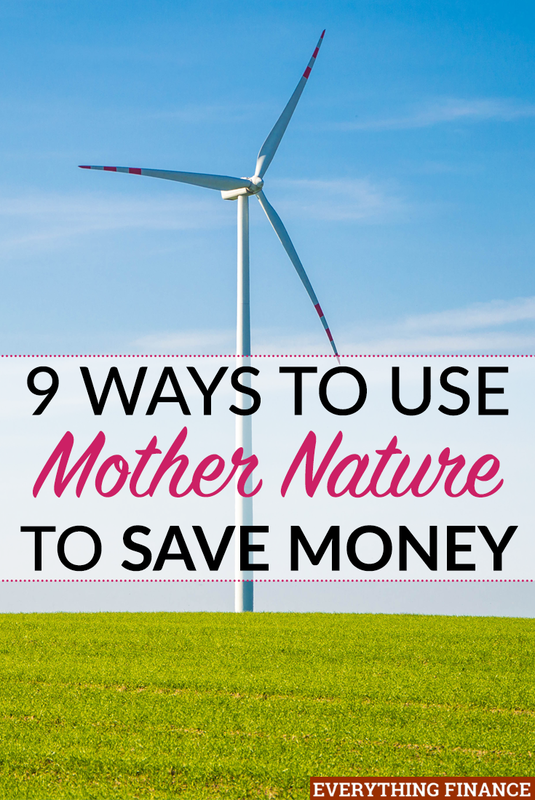 Here are 9 great ways Mother Nature can save you money. You may wonder how people in the olden times lived during hot summers without air conditioning. I get it, I love having my AC on during hot summer days, too. But they had several tricks to help keep them cool. One way they stayed cool was by having houses with lots of ventilation, or by using Mother Nature to cool their homes in the evening and overnight, and shutting out the heat during the day. By turning the air on later in the year and shutting the heat off in the lovely transitions of spring and fall, you can cut your energy bill by quite a bit. Plus, you’ll also benefit from the fresh air when you use Mother Nature to regulate the temperature in your home. Modern conveniences of fans and ceiling fans can still help circulate the air and are cheaper than running the AC or furnace. Almost everyone knows you can save on your energy and gas bill in the winter by turning down your thermostat when you aren’t home, and at night when you are likely under a big blanket anyway. But even when you are home during the day, opening the blinds and window treatments can warm up the room without turning up your furnace. Just be sure to close them before it gets dark to conserve the heat brought in from the day. A little bit of savings here and there can add up. The light of the sun is free and can be harnessed into electricity, thanks to the developments of science. Converting your home to solar power can be expensive, but thanks to government rebates and the lower cost to produce solar cells, the up-front cost isn’t as high as it once was. The return on your investment can be seen fairly quickly, and once your investment is “paid off” in savings, you’ll be able to really save money by using Mother Nature to power your home. Wind turbines and other methods of harnessing wind energy have been around for decades, but only within the past ten years or so has it become popular again. You can run your home off of a small turbine, and put energy back into the grid, depending on where you live. Again, the up-front costs are high, but there is a potential for money savings in the long-run. This is yet another way to go green and power your home. The initial cost for this is expensive as well, and it takes a little longer to see a return on your money than with other “green” energy conversions. But it does cut down your energy cost, thus saving you money. When considering alternative energy routes for your home, be sure to do your research and make sure you know all the pros and cons before starting a project. National parks and local parks are available to anyone in the general public. They are great ways to get outside and get some fresh air! Most city parks have playgrounds that provide an excellent free resource to families and helps develop social skills of children. Some national parks are free and others charge a fee depending on what your plan is. The fee isn’t much compared to what you gain from venturing around our beautiful landscapes and enjoying Mother Nature. Gardens were the only way people got fresh food for years, until modern technology and farming started mass producing food. But you can still plant your own garden in your backyard to help you save money on your grocery bill. Depending on the amount you grow, and if you buy plants vs. seeds, you can put little money into your garden and reap large rewards. Make sure to use all you produce by freezing, canning, drying, and storing it to eat the rest of the year. You could also sell some of it at a farmer’s market to gain a little income on the side. Watering plants in the summer can increase your water bill, especially if there is a drought and you have to water them yourself instead of relying on Mother Nature. By building or purchasing a rain barrel, you can save on your water bill by using the rainwater you collect to water your plants later. You can do the same with water collected from a dehumidifier. It’s free, other than the cost of the barrel. Just make sure it’s not illegal in your community to collect rainwater. What I mean here is fishing and hunting. The equipment needed to go hunting can get expensive, but it’s also a great way to enjoy the outdoors and what Mother Nature has to offer and you can find fish tech at fish finder reviews. Many families still stock their food supply by hunting and fishing. If you want to give this a try visit The Comfy Traveler for the appropriate equipment. You can save money on buying meat, and enjoy the fruits of your labor. Not only can relying on Mother Nature save you money, it can also bring better health. Going back to nature and embracing some of these methods and reaping the savings is worth it. While you don’t necessarily have to convert your home to solar or wind energy, you could still turn your air conditioner on later and the heat off earlier in the year. Open those windows and enjoy the fresh air and the savings Mother Nature has to offer. Have you done any of these things to save money? Would you like to go more green in the future?